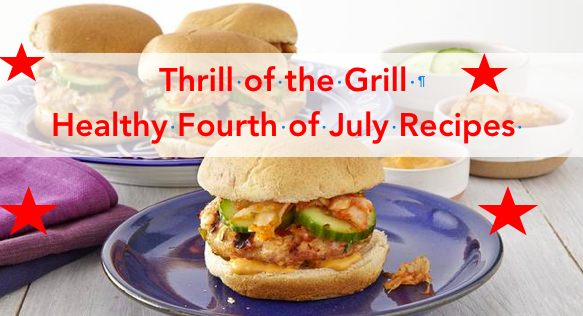 The Fourth of July is the number one grilling day of the year. Nearly 9 out of 10 Americans will be hosting or attending a cookout of the holiday weekend. 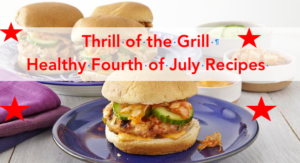 A typical July 4th BBQ menu of burgers, brats and creamy sides can pack in more than you need in a day and more than two days’ worth of fat. With a menu tweaks, you can fire up the flavor ‑minus the extra fat and calories. Starters and Sides: Appetizer calories (think creamy side dishes and sour-cream dips) can really pile up, so make sure you have a lot of fiber-rich and calorie-poor veggies with healthy dips, like black bean dip, hummus and Greek-yogurt based dips. I also serve Mediterranean-style pasta and potato salads, to infuse more veggies onto the menu along with heart-smart extra virgin olive oil. To build a healthier burger, use a lean ground beef like sirloin, and opt for a chicken or turkey sausage. You can shave more than 100 calories, mostly unhealthy fat calories, by making a swap from high-fat ground beef or a regular pork or beef dog to leaner options. If you have Paleo party-goers, I like to grill sausage and veggies together on a kebob so that they have a great Paleo-friendly option to enjoy. Your fixings can make a big difference too on your meal’s healthfulness. Be sure to have lots of veggie toppers like leaf lettuce, sliced tomato and grilled veggies. 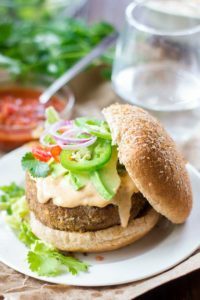 Always use whole-grain buns for the extra fiber and antioxidants they provide. For something sweet, I opt for using in-season fruit like berries and watermelon — one of my favorite summertime combinations. Your options are endless for making delicious desserts with fresh fruit. Use star-shaped cookie cutters and cut watermelon into stars and put onto skewers with blueberries or make a fruit salad. For baked goods, I often make a healthier sugar-cookie that I can decorate in red, white and blue. I use a sugar alternative to slash the calories in my family favorite recipes. A fresh strawberry or triple berry tart is another one of my family favorites.